In honor of Autism Acceptance Month, Femme Frugality will be running a series of Friday articles in April that focuses on the financial challenges and triumphs Autistic people face and achieve. If you have a child on the spectrum, you have one child on the spectrum. Your kiddo’s needs are completely different than the child next to them–even if the other child is on the spectrum, too. With that in mind, today we’re going to be reviewing a governmental department which has resources to help those with disabilities–including autism–get the resources they need to start their careers off on the right foot. Your child does not have to have communication issues or visually-obvious accommodations in order to qualify for services. If you are Autistic and American, you can benefit greatly from these services directly. Though I am writing to parents in this article, I do not mean to talk around you. But parents have a responsibility to figure these things out for their minor children, and I’m hoping that everyone has access to these services as young as possible. However, the programs run by this department can help you throughout your life even beyond the days of youth. The federal government provides funding to state vocational rehabilitation agencies for a number of purposes. They aid both employers and job seekers to build inclusive workplaces, and go the extra mile to make sure training is available to those with medical needs. Their aim is to help the disabled secure meaningful employment that highlights their skills, talents and interests. Their job is to remove barriers that may stand in their way of securing such employment, such as lack of guidance, lack of funding or lack of awareness and knowledge on the part of the employer. It costs less to provide these services than it does to take care of an unemployed person. It costs less to take care of an unemployed person in their own home than it does in an institution built to accommodate those with disabilities. Reagan himself made policy changes for the disabled for this very reason, notably via Medicaid expansion. Rather than railing on government spending in this arena, we should all be lauding it. It not only lowers societal costs; more importantly, these programs serve to bridge the gap between the oppressed and the ill-fitted places of employment our societal disablism has created. All right. Let’s get down to business and check out the resources available to those with medical-need at large–including Autistic individuals. As a disabled student, your child has access to certain career-focused programs in middle and high school. The age at which your state starts attending IEP meetings to facilitate these opportunities through Individualized Plans for Employment (IPEs) may vary depending on which state you live in. Generally speaking, it’s a good idea to get in touch with your state vocational rehabilitation agency as your child transitions from elementary to middle school–or around age 12. Even if they are not eligible for services just yet, staff can make you aware of the programs that exist in your state, and make you aware of the earliest age at which your child qualifies for specific services. Facilitation of guest speakers relevant to your field(s) of interest. Information about relevant career fairs. Information regarding relevant volunteer opportunities in the area. Direct employment programs during the latter years of high school. Education about your rights in post-secondary educational settings and the workplace, along with coaching for self-advocacy. Information and access to job-specific education opportunities, including but not limited to vo tech schools and community colleges. This is by no means an all-inclusive list. And not every opportunity will exist in every area of the country. But working with your state vocational rehabilitation agency will help you find as many of the doors that are open to your child as possible. No matter your child’s (or your own) age, there is a specific program across states that allows for funding of higher education. Some states, like Pennsylvania, will only offer funding up to the average cost of community college, the reasoning being that the Office of Vocation Rehabilitation works in tandem with the state school system and community colleges to provide adequate services and accommodations to disabled students. You don’t necessarily have to go to a state school, but the amount vocational rehabilitation funding will be capped at that community college level. Other states may pay full tuition even through grad school pending the availability of funds. Regardless of how much money you or your child is eligible for, you should take measures to get in touch with your state’s Vocational Rehabilitative Services agency. Any money for college is good money for college! Note that for this program, you do not necessarily have to prove SSI disability qualification. As an individual on the spectrum, your child will qualify as disabled through SSI, but the SSI rigamarole is not something you’ll have to go through for this particular program. Vocational Rehabilitative Services which provide educational funding don’t have an age requirement. But so much else does when your child turns 21. Insurance requirements and coverages change, IEPs and the state school system are no longer required to execute the next step in your child’s growth, and if your child isn’t on the path to a traditional college education, it can be difficult to find support services which help them live a functional, meaningful life–even if they exist. That’s where your state vocational rehabilitation agency can help. Well, sometimes. There are programs available which offer meaningful employment and social opportunities to those with communication and sensory needs dramatically divergent from the neurotypical population society has traditionally accommodated. The hitch is your state has to choose to allocate their funding towards these programs. Even if your state does not directly offer these types of specialized employment opportunities, your state vocational rehabilitative agency may be able to point you to other community organizations which do. And if they can’t? They will have other programs established. The first step to learning more about them is contacting your state vocational rehabilitation agency. They’ll sit down and work with your child to create a plan to get closer to meaningful employment. Getting resources and planning with your child for their future is definitely a long game. There are so many steps in the process. It’s legitimately a lucky miracle if you know some of these programs exist at all. As you’re going through the process, here are some resources that can help make you and your child aware of their rights, services available to them, and the best available ways to pursue their dreams. Here are a few. If readers know of any more, they are highly encouraged to share them in the comments and I’ll add them to this list! ASCOT Coaching: The transition from high school to college is challenging for all kids, but there are a few more barriers when you’re on the spectrum. Amy Gravino is on the spectrum herself, and serves as a coach to this demographic on a sliding scale, variable dependent on financial need. View her services here. 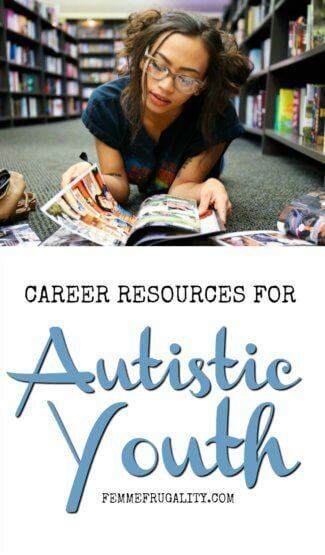 This entry was posted in College Money, Family Finance and tagged Autism on April 5, 2019 by femmefrugality. I LOVE that you are covering this too-little discussed topic! So much focus on the younger years, but planning ahead for the future is so smart! Thank you for sharing this, Femme!